It’s that time once again….School starts tomorrow! I don’t know about ya’ll but I’m already exhausted. 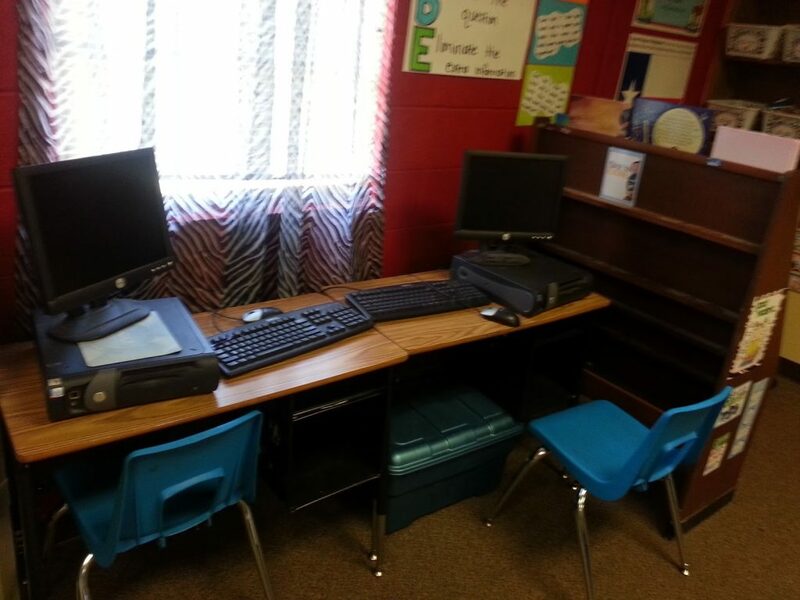 I posted a sneak peak of my classroom during Teacher Week but it wasn’t all the way finished then. 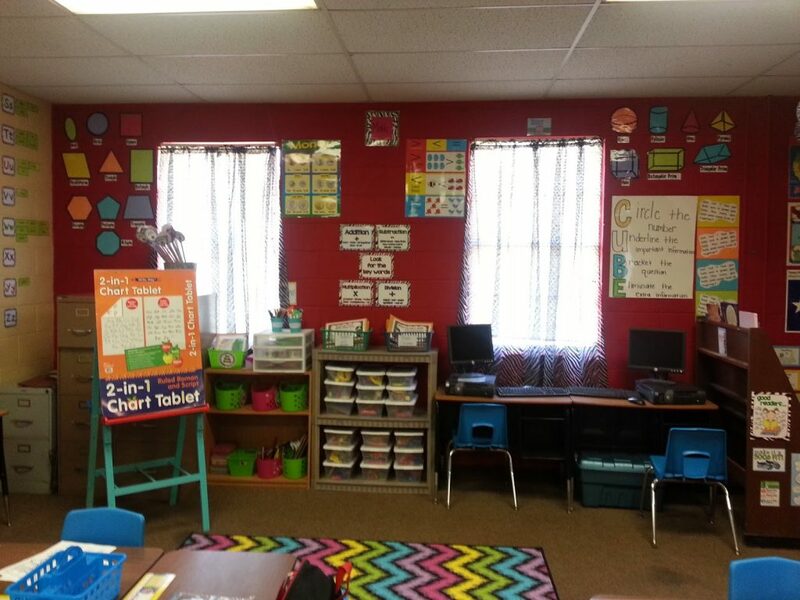 After several 12 hour days my classroom is finally ready for reveal! My display wall is pretty plain. My building is very old and we can’t hang a lot on the walls because everything takes the paint off the wall. You can see a few missing chips. 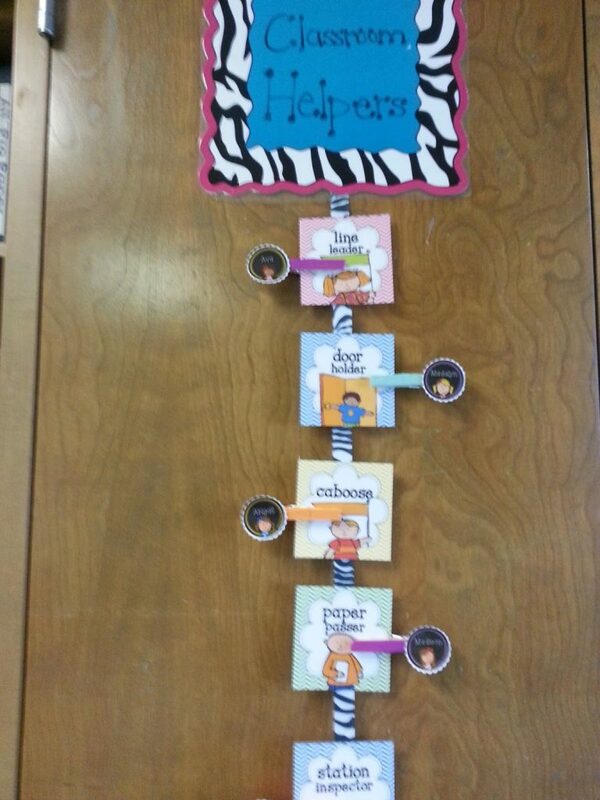 I am going to add their names above the clothes pins. 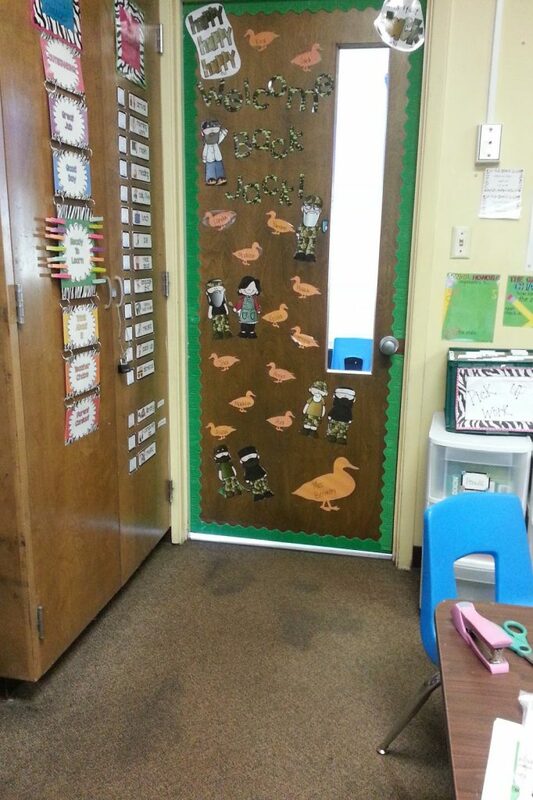 Here is the inside of my door! I just love how it turned out! It makes me HAPPY, HAPPY, HAPPY! 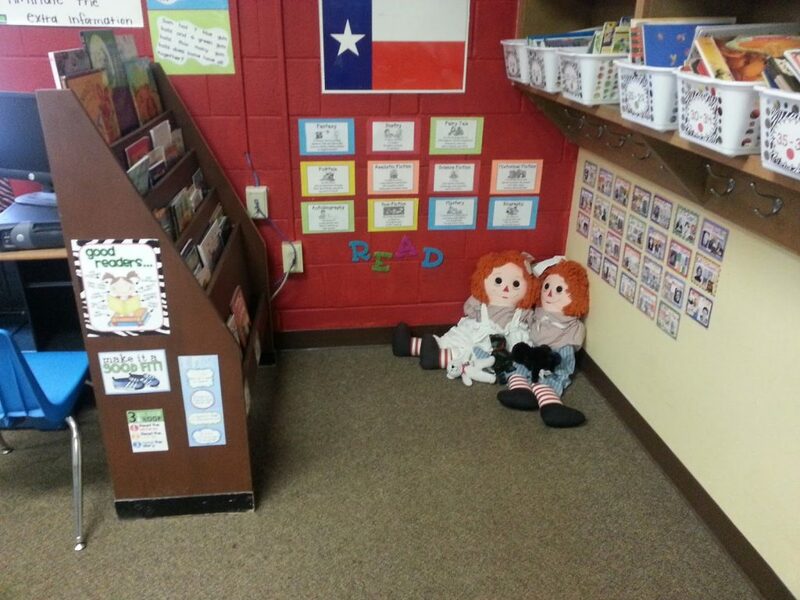 Here is a close up of my classroom helpers! These came from A Cupcake for the Teacher and the name badges are from That’s So Second Grade. Don’t judge me for not having a “cute” pick up work sign. I just simply ran out of time. I’ll change it eventually. 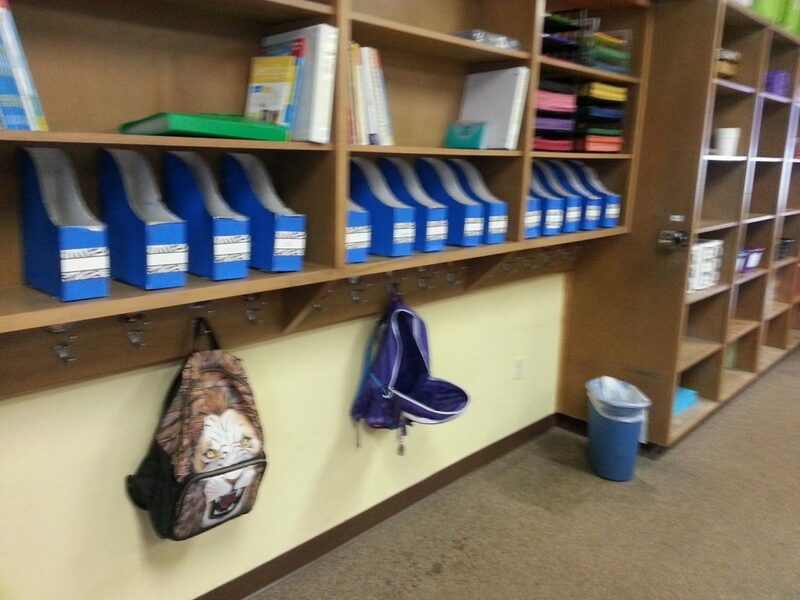 The crate holds student hanging folders. This is where I put all of their work to be passed back. 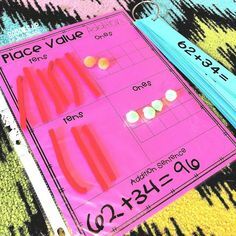 They are in charge of getting their homework and graded papers out of it each day and putting in their take home folder. 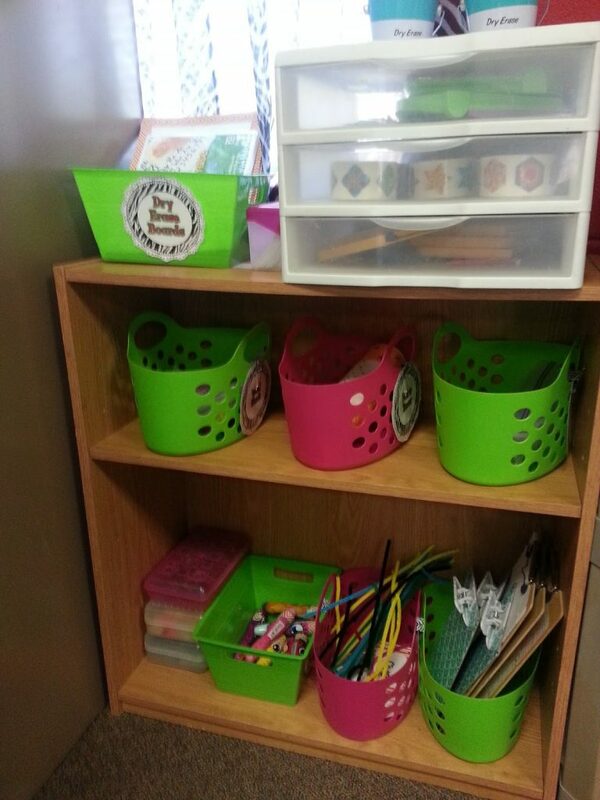 The drawers just hold random supplies. Last year, I made my students highlight their name before they turned their work in. 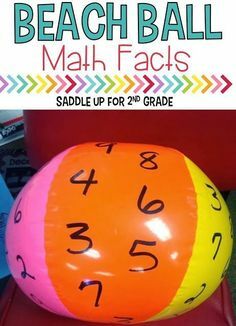 This was a life saver! I rarely had a “no name” paper! They love using the highlighters so its as win, win situation. 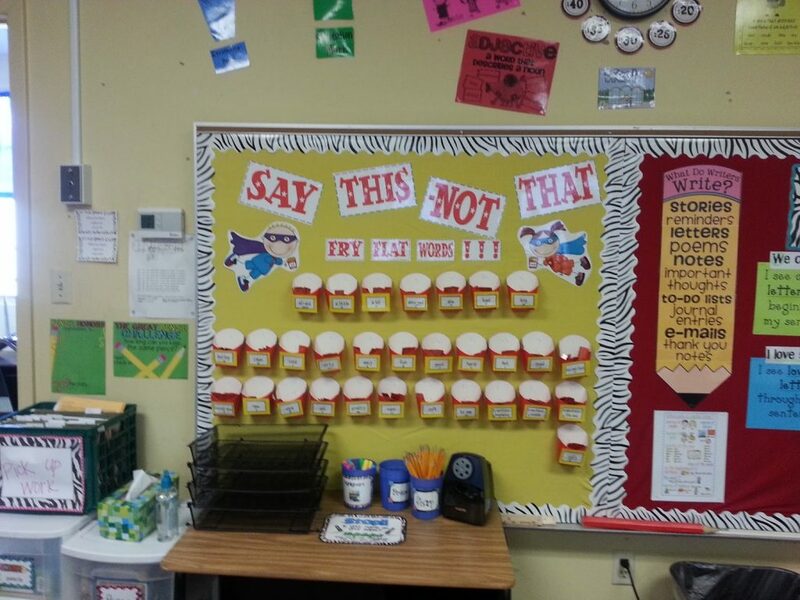 I absolutely LOVE my “Say This, Not That” board! This awesome set came from Hilary Lewis. When we start our writing units, they can go over and pick a fry with a new fancy word! I can’t wait to start using it! It was a big hit at meet the teacher! 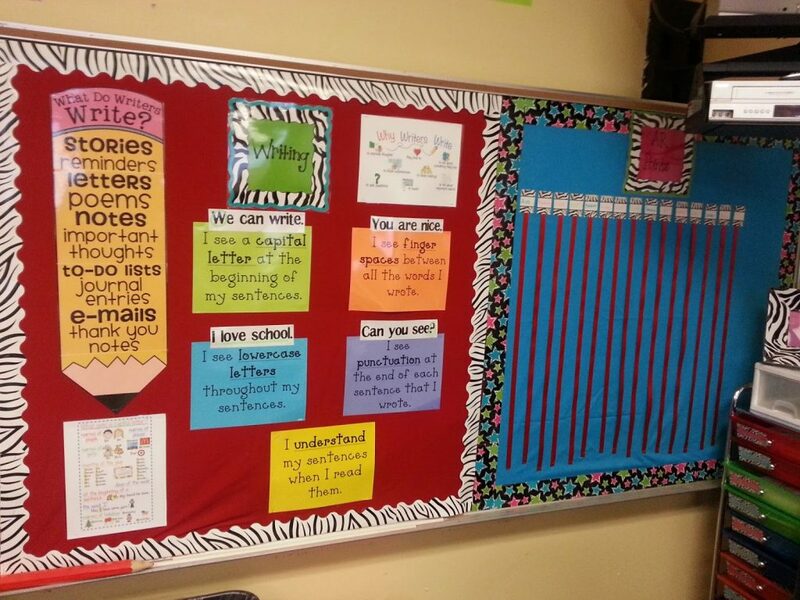 Then you have my writing board and my AR board. This AR board was changed last minute. 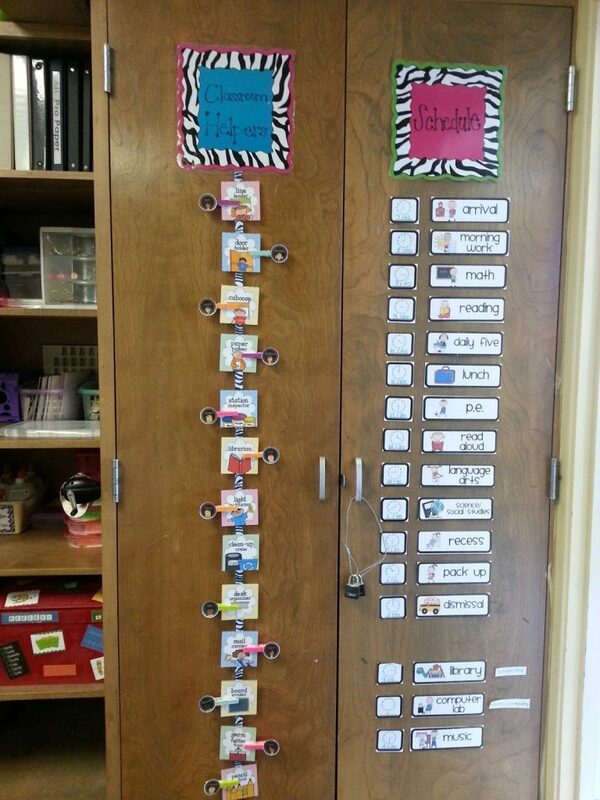 Originally had a classroom snapshot board but changed it just a few days ago. 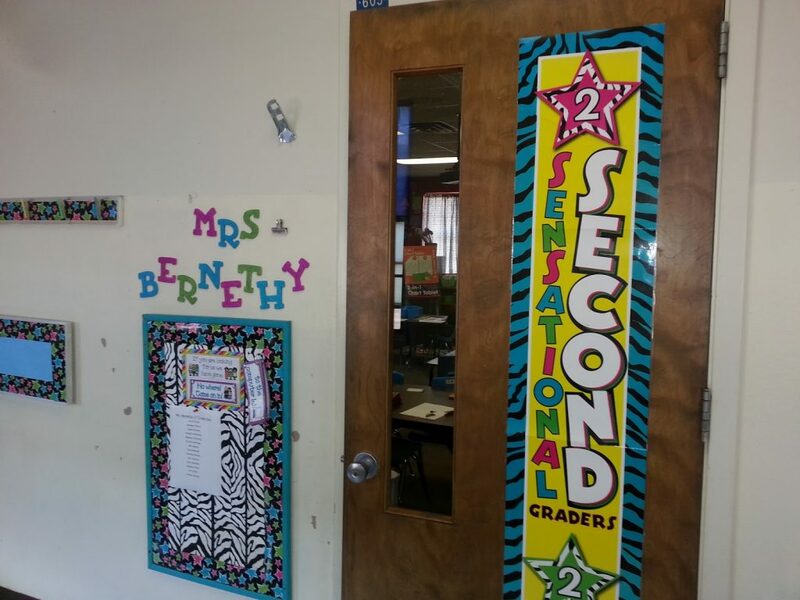 To see how I use AR ribbons in my classroom click here and to get my AR circles freebie click here. 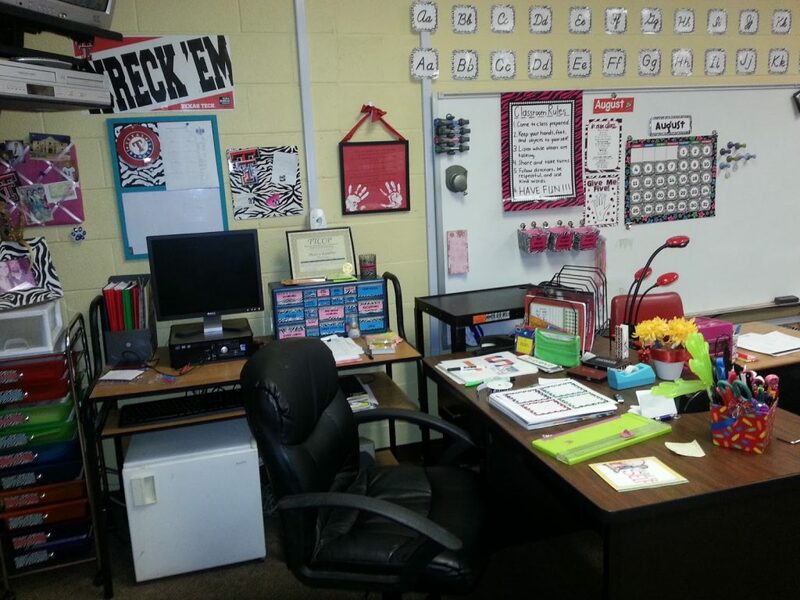 Here is my teacher area. Yes, I already have stuff all over my desk. It will probably stay this way most of the year. The front view of my room. 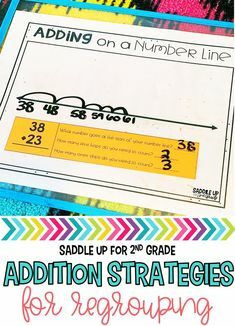 You can get the zebra cursive line here and the primary line here. 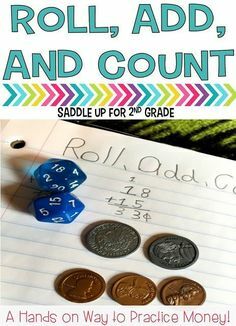 The number posters can be found here. My birthday posters are displayed under my board. You can get them .here. 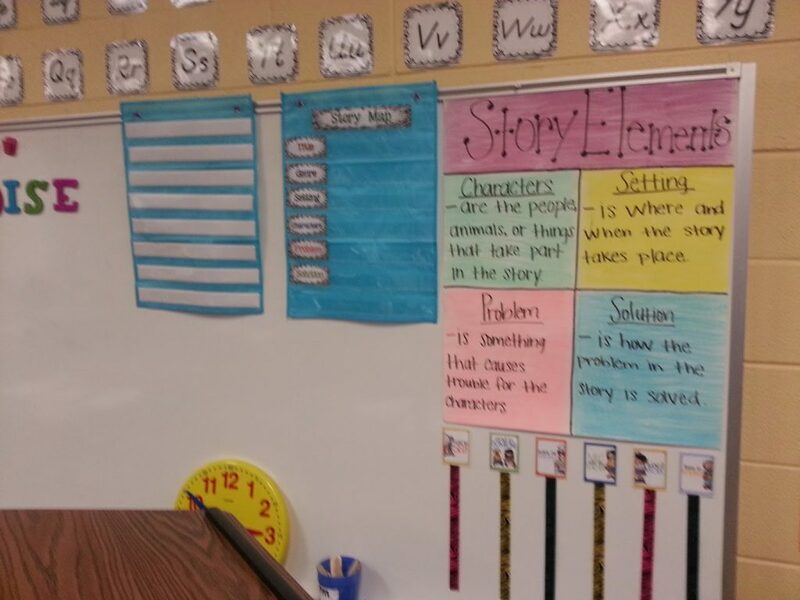 Here is my story elements chart, story map display and my daily 5 rotations. 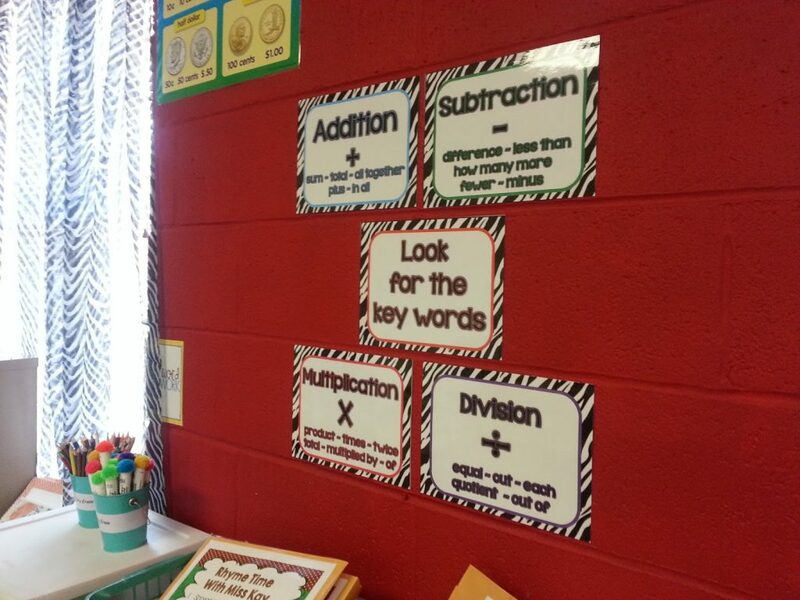 The other chart will be used to display math vocabulary. 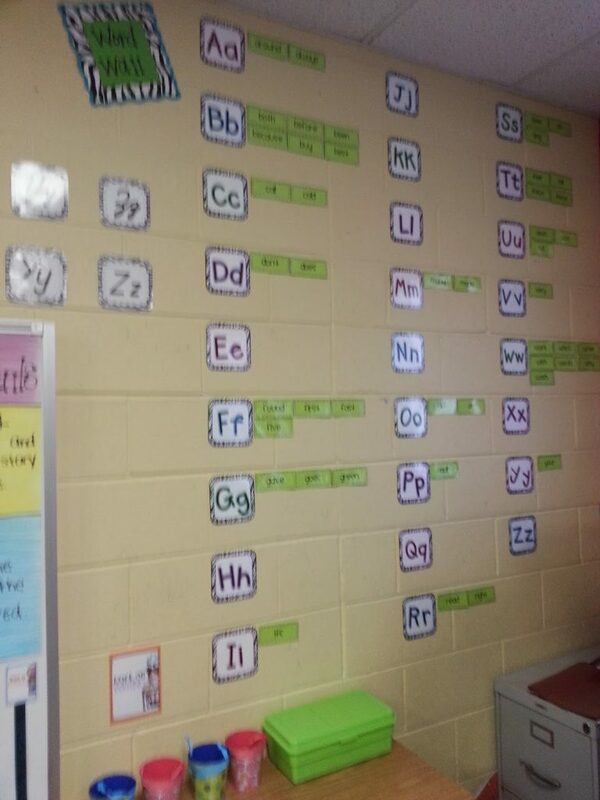 Here is my word wall. You can get the headers here. 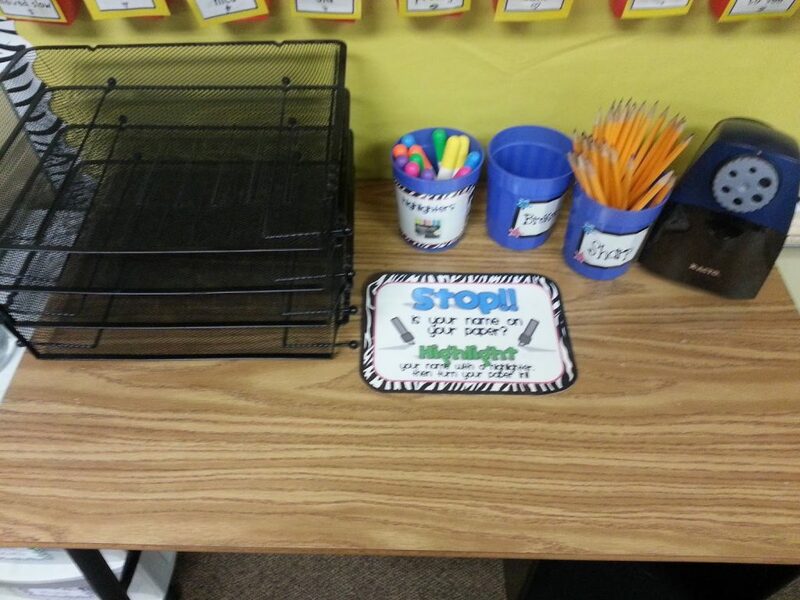 Here are my word work stations. 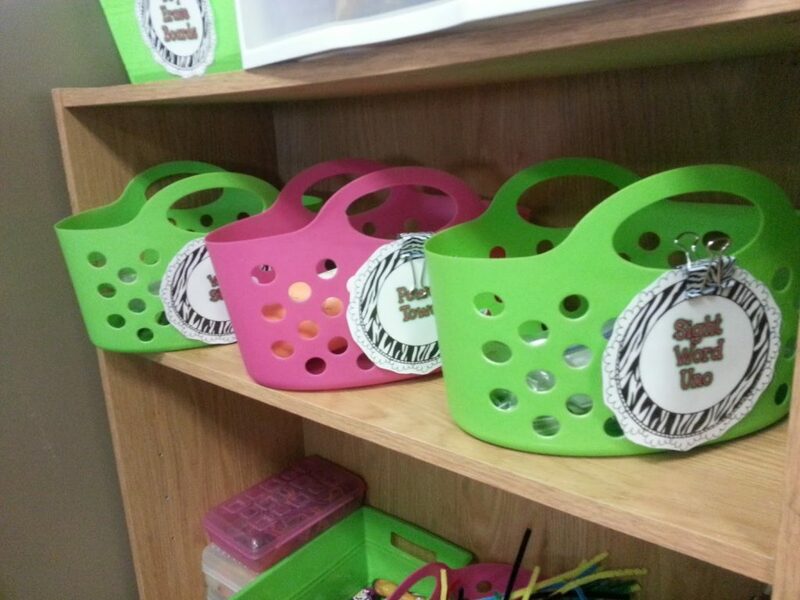 There is an activity in each basket. I’ll swap them out every few weeks with new activities. This is what my back wall looks like. Its bright red and I love it! It mainly holds my math posters. I’ll add more to it when concepts come along. You can get my key word posters here. 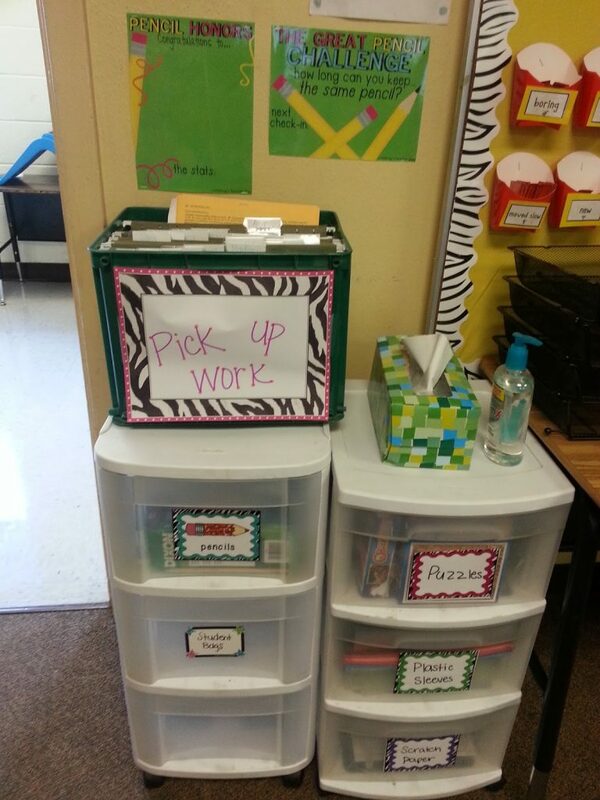 My math tubs are ready to go for the year! 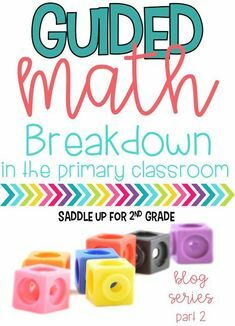 Click here to see how I use them throughout the year. 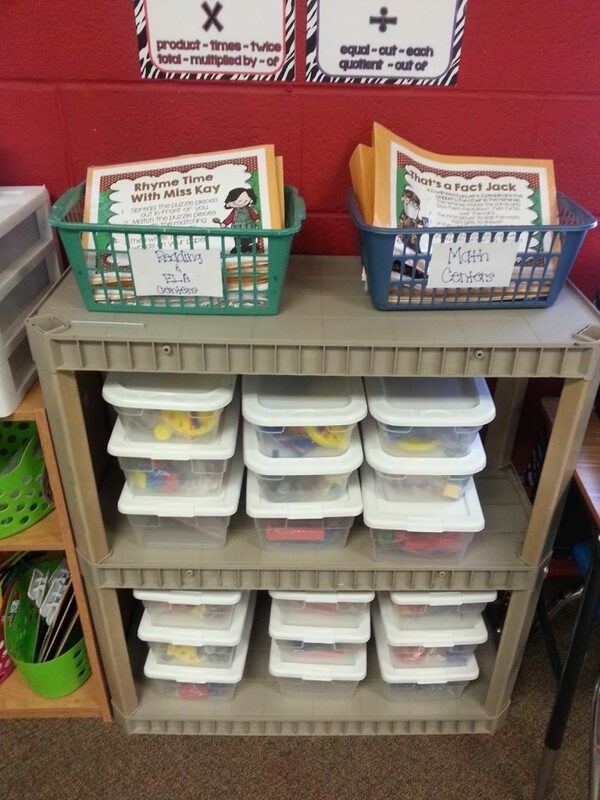 My Welcome Back Jack centers are ready to go! My library. This is my first year to have it so organized. I love how it turned out! I didn’t realize this picture was so blurry!! 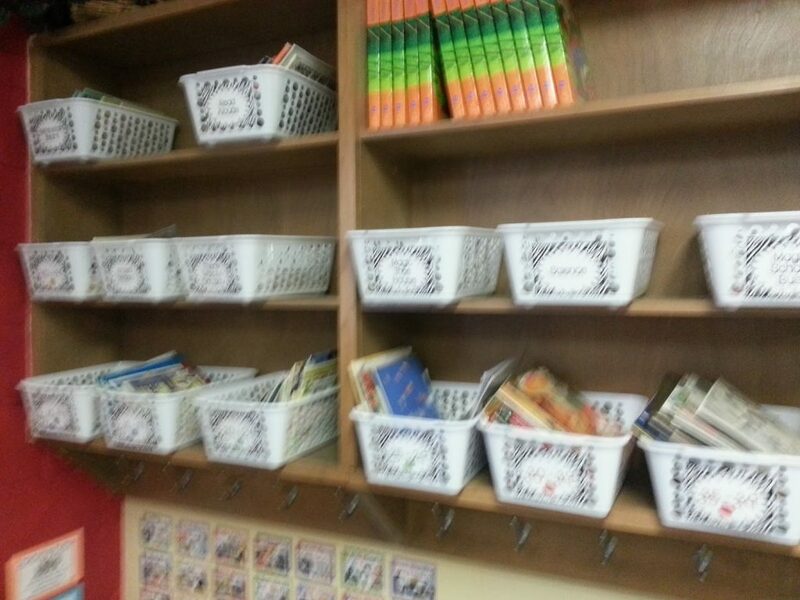 My books are organized by AR level and then I have a few baskets with sorted books by titles. 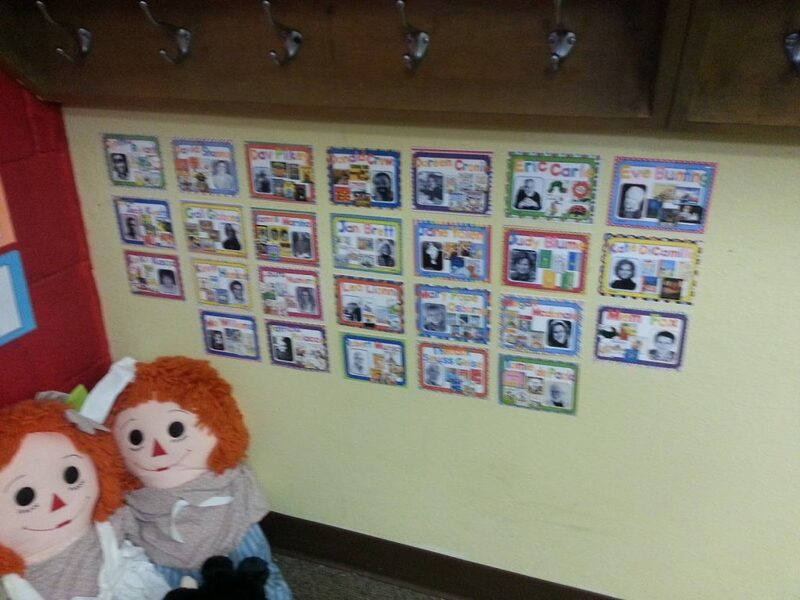 That’s So Second Grade has the great author posters for FREE! Here is my back wall of shelving! 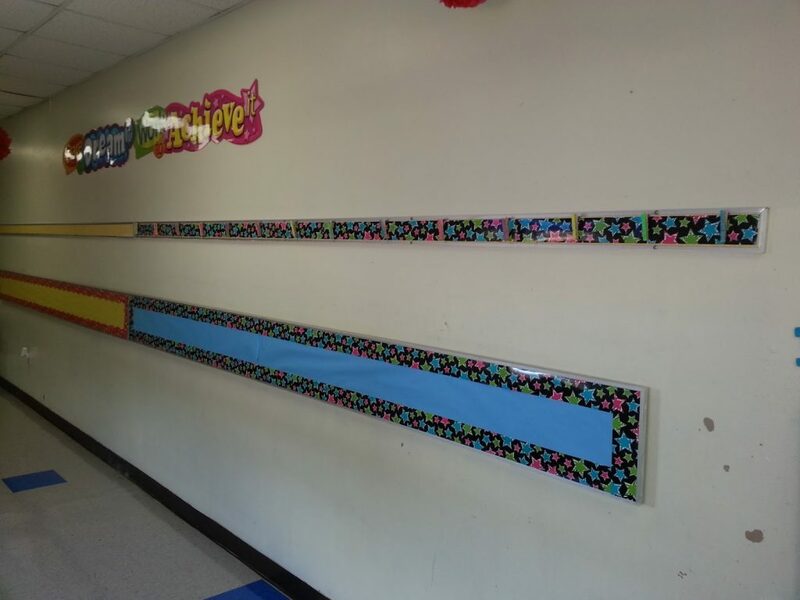 This is where the kids back packs will hang. 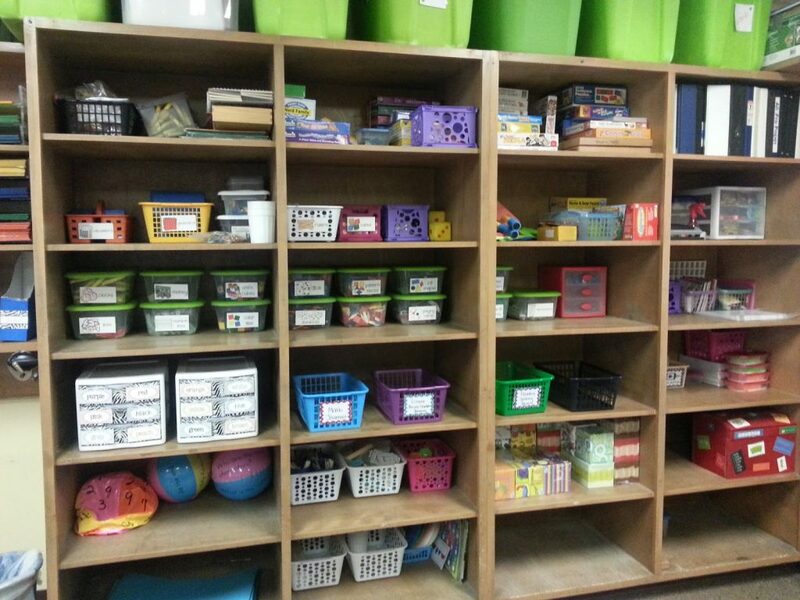 And last but not least my storage shelves! These hold all of my supplies. There you have it folks! 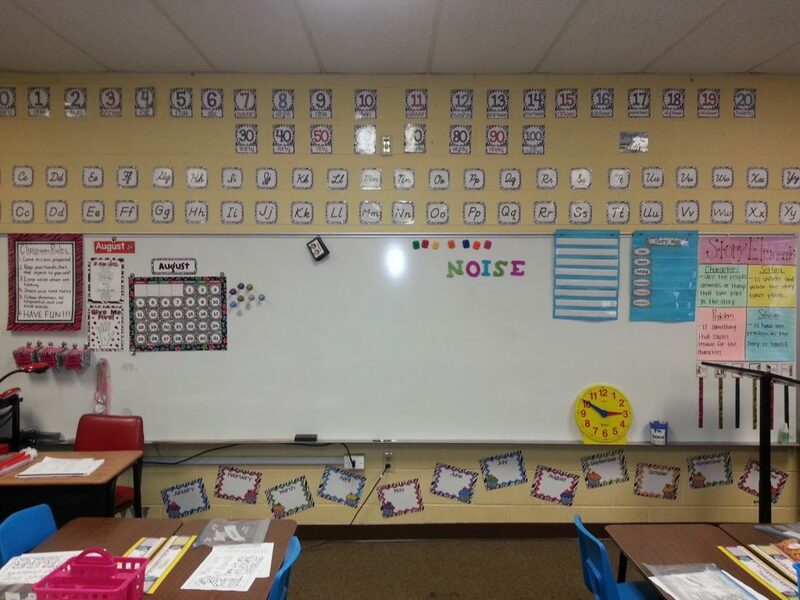 My room is all ready for the first day tomorrow!